While the core drivers of the Kraft Foods and H.J. Heinz Company merger agreement are clear, the implementation specifics that will determine how this massive deal plays out for the combined company and the broader industry leave ample room for speculation. Assuming the approximately $37-billion deal is approved by Kraft shareholders and regulators and goes through in this year's second half, as expected, how will management of The Kraft Heinz Company realize the potential $1.5 billion in savings by the end of 2017 that the companies cited in announcing the merger? How will they attempt to leverage existing synergies and strengths and create new ones? What are the likely ramifications for competitors and the broader industry? While many of the answers won't be known for months and years, here's some food for thought, based on Marketing Daily's interviews with consultants who have worked closely with Heinz, Kraft or both as former clients, public statements by the principals, and insights gathered from initial reactions in the media. Players as savvy as Heinz owners 3G Capital and Berkshire Hathaway — who are under the deal providing $10 billion to fund a special dividend of $16.50 a share for Kraft shareholders — obviously have some specifics in mind in citing their savings estimate. And 3G's aggressive cost-cutting modus operandi has set examples that have been studied closely and are being at least partially adopted by many large food and beverage companies looking to improve the bottom line as sales have stalled in many CPG categories. 3G cut some 7,400 jobs after the Heinz acquisition, for example. "There's no question" that jobs will be cut in the Heinz/Kraft merger, says David Stone, managing partner in The New England Consulting Group, which has worked with Kraft and Heinz extensively over the years, though they are not currently clients. One obvious area for consolidation is the sales forces, where there is significant overlap in retail customers and channels, he notes, adding that management will undoubtedly identify many areas of "synergy" ripe for realizing efficiencies and substantial cost savings, not just in labor, but in operations, systems and processes across the organization. In a press conference call yesterday, 3G managing partner and Heinz chairman Alex Behring, who will become chairman of The Kraft Heinz Company, said that realizing efficiencies are obviously one key reason to "put two big companies together." He stressed that top management would be closely evaluating both companies and adopting the best practices of each. He also noted that zero-based budgeting — mandating that managers essentially start from scratch each year in building and justifying a budget — has been employed successfully by 3G in the past, and will be "an integral part of the process" at The Kraft Heinz Company, as well. The practice can cut sales, general and administrative costs by 10% to 25%, according to a McKinsey & Co. report cited by The Wall Street Journal, but as Coca-Cola VP of strategy Brent Hastie pointed out in an interview, Coca-Cola has chosen to call its own newly adopted budgeting process "zero-based work," because of the negative connotations associated with "zero-based budgeting" — including sweeping job cuts — as a result of the 3G Heinz scenario. Dean Crutchfield, SVP of brand consultancy Sterling Brands, declines to speculate about job cuts, but agrees that there are potentially major efficiencies to be realized, and stresses that how well the two teams and companies are integrated will obviously be crucial in determining the merger's short- and long-term outcomes. "The so-called 'softer issues' in an M&A — including identifying and retaining key talent and personnel and remembering to focus on those who are staying on, keeping them confident and pumped up — are actually paramount," he says. Crutchfield points out that management will also no doubt leverage the significant cost savings potential in the major line item of media spending, by leveraging synergies, scale and "firepower" across the combined portfolio. He adds that he does not believe that management would undercut the existing media budgets of brands. Current Heinz CEO Bernardo Hees, who will become CEO of The Kraft Heinz Company, stressed that "over the past two years, we have transformed Heinz into one of the most efficient and profitable food companies in the world while reinvesting behind our key brands and continuing our relentless commitment to quality and innovation." The merger announcement also stressed that 3G and its principals "have a proven track record of investing in and growing iconic brands... In previous transactions over the years, 3G has partnered with other long-term investors to build significant shareholder value by driving innovation and growth and expanding the international reach of its companies and brands." However, Stone says that while Berkshire Hathaway's Warren Buffett is known for holding onto his investments and investing in the brands, 3G's philosophy on that score won't truly be clear for some time. He says that Heinz's sales are actually down by almost 5% year-over-year. "You can make a lot of money, but if you don't invest in the brands over the long term, you can't sustain or grow a business," he says. Both consultants also believe that how cultural differences are managed will be crucial. "These are actually very different cultures," says Stone. "Kraft is a white-glove company that has been driven by consumer insights; Heinz is much more rough-and-tumble. I wouldn't underestimate the potential for cultural and management issues." As the principles stressed, the merger would represent potentially huge growth opportunities both in North America and globally. 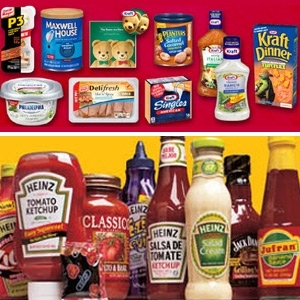 Most observers agree that the international prospects are particularly attractive, given the new ability to use Heinz's extensive global infrastructure as a platform to turn largely North American-focused Kraft into a truly global entity. Kraft generated about 13% of its 2014 consolidated net revenues and 14% of 2013 and 2012 revenues outside the United States, but primarily in Canada, according to RTT News. The merger "is exciting because it will create a major new global player," says Crutchfield. "Given the size and power of the combined brand portfolio, they have an opportunity to own the cupboard on a global scale." Kraft's portfolio, of course, includes many of North America's most popular food brands, including three with annual net revenues exceeding $1 billion each: Kraft cheeses, dinners, and dressings; Oscar Mayer meats; and Philadelphia cream cheese — plus more than 25 brands with individual annual net revenues between $100 million and $1 billion. The new combined company will have revenues of approximately $28 billion with eight $1 billion-plus brands and five brands between $500 million and $1 billion. Other possibilities in domestic and perhaps international markets cited by the consultants include driving growth by exploiting synergies such as those among brands within overlapping categories. Virtually all observers believe that the combined company's ability to achieve true innovation will be a make-or-break in the years ahead. While principals in the merger stressed that it will provide critically enhanced clout with retailers and in the center store, Stone points out that today's huge, consolidated retailers have the balance of power, and that creating and implementing an innovation strategy will be perhaps the biggest challenge for all food and beverage companies going forward. He notes that — at least in part because of consumers' changing habits and growing preference for fresh as opposed to processed foods — a preponderance of CPG food and beverage categories are seeing sales stagnation or decline. That includes the frozen category, home of Heinz's big Ore-Ida and Smart Ones brands. "The problem is that a lot of the growth now is coming out of smaller CPG companies offering innovative products," Stone says. Big CPGs have to wrestle with how to overcome entrenched attitudes, processes and operations and drive innovation internally — as well as think seriously about investing in smaller, more nimble and innovative companies, as many are already doing, Stone and others point out. While the merger would seem to be a potentially significant competitive threat to other large CPGs, Stone points out that it could also present "an interesting opportunity to grab share," as the newly merged Kraft/Heinz entity sorts itself out, and also depending on its brand investment and other strategic decisions. One possibility, for instance, is that management might look at selling off some brands that are being hurt by newer, more innovative brands in the same category, like Heinz's frozen brands.